High blood pressure and pregnancy can be a dangerous combination. If you have high blood pressure and are thinking about getting pregnant, make sure you check in with your doctor. You'll want to do everything possible to keep you and baby safe. High blood pressure is a problem even when you're not pregnant. If not treated, it increases your risk of heart attack and stroke. It can also cause problems with your kidneys and your vision. High blood pressure won't usually affect your ability to conceive. 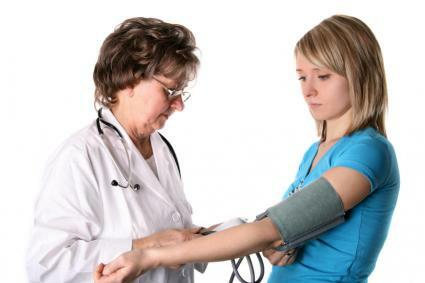 However, once you become pregnant, high blood pressure brings a new set of risks. It can reduce the blood flow to the placenta. The placenta is the baby's connection to your own body, allowing oxygen and nutrients to pass from you to him/her. Without proper blood flow, the placenta doesn't work right and your baby can't grow properly. Another risk from high blood pressure is placental abruption. Normally, the placenta is attached to the wall of your uterus until the baby is born. If it detaches too early, which is called "abruption", you can have severe bleeding into the uterus. This is dangerous for both you and the baby. High blood pressure can also increase the chance of your baby being premature. If you normally control your high blood pressure with diet and exercise, following the same routine may be all you need to do. Check with your doctor to find out if your exercises are safe for the baby, or if there's a time in pregnancy when you should stop. Some blood pressure medications are considered safe to use during pregnancy, but some are not. If your high blood pressure is mild, your doctor may have you stop taking medicine altogether. Most women experience a drop in blood pressure during the first half of pregnancy. It's possible that your blood pressure will be normal during that time. Later on, close monitoring will help you know if treatment is needed. Methyldopa: (Brand name Aldomet) This drug is often used for the combination of chronic high blood pressure and pregnancy. The FDA rates it as "usually safe" in pregnancy. Side effects include dry mouth and sleepiness. Serious adverse effects include liver problems. Pindolol: (Brand name Visken) This medicine is a type of beta-blocker. Many beta-blockers are not used in pregnancy because they are thought to cause mild fetal growth restriction. Pindolol seems to have a lower risk of causing this problem, although doctors can't say for sure. It's also rated "usually safe" by the FDA. Nifedipine: (Brand names Adalat and Procardia) This is a type of calcium channel blocker. The FDA says that "safety during pregnancy has not been established," which simply means that it hasn't been thoroughly studied. Many doctors feel that it's safe; your own doctor can help you make the decision. Angiotensin-converting enzyme (ACE) inhibitors: (Brand names Vasotec, Prinivil, and Altace) ACE inhibitors should not be used during pregnancy. They can cause the baby's kidneys to develop improperly and even lead to fetal death. Angiotensin II receptor blockers are another type of medicine that work in a similar way. They should be avoided during pregnancy, too. Early in your pregnancy, your doctor will do some routine tests to check for anemia and other problems. For women with high blood pressure, these tests should always include a urine test for protein and a blood test for liver function. This is because preeclampsia, a dangerous condition that can develop during pregnancy, involves high blood pressure, protein in the urine, and sometimes liver problems. The high blood pressure in preeclampsia has a different cause than chronic high blood pressure, and it can signal immediate danger. If your blood pressure goes up during your pregnancy, your doctor will need to know if it's just your usual high blood pressure or a sign of preeclampsia. Comparing new tests to your baseline values will help. When You Have High Blood Pressure at MayoClinic.com. High Blood Pressure in Pregnancy from the National Heart Lung and Blood Institute.